 YOUR NEW FAVORITE GRILL & BBQ TOOL IS HERE! If you are the #1 BBQ planner among your friends, if the smell of tasty sausages and juicy steaks on a grill makes your mouth water, then this grill & barbecue accessory will become your favorite grilling companion!  MAKE YOUR GRILLING LIFE EASIER! 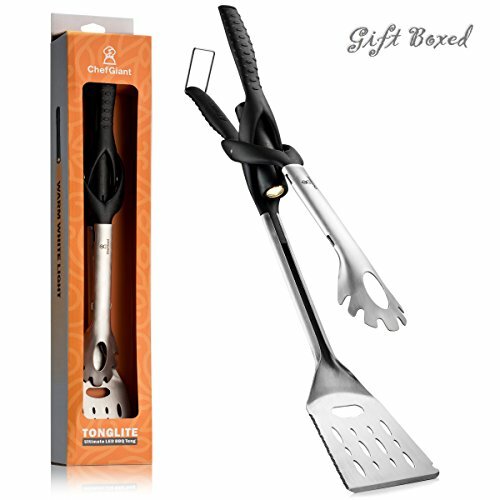 Thanks to its innovative design, this Tonglite will make your grilling job a breeze, since it conveniently combines 6 different tools in one; tongs, spatula, knife, opener, scraper and flashlight. Talk about many birds with one stone!  SHED LIGHT ON YOUR DELICACIES! The ultimate addition to this handy and useful utensil is, of course, the LED flashlight it features, which allows you to perfectly see your meats color and know exactly when you have to flip or remove it from your grill!  AN ACCESSORY FOR A LIFETIME! The main metal body is made of superb quality 430 stainless steel, while the handle is made from fiber reinforced nylon. It is a multi-tool that is sturdy, safe for your hands, AND bound to last you for a very long time of use. Plus, to its great quality, this Tonglite is dishwasher safe for easy cleaning.  IDEAL FOR PROFESSIONALS & HOME USERS ALIKE! It doesn't matter if you are a professional gourmet chef, or you have just begun experimenting in the kitchen; this piece of grill accessory is excellent for all kinds of barbecuers! If you have any questions about this product by ChefGiant, contact us by completing and submitting the form below. If you are looking for a specif part number, please include it with your message.